with cage are set up in the space between rollway and collar and the cage reliably guides and clamps a lot of rolling bodies. There is a little difference among the rolling bodies in the same set. 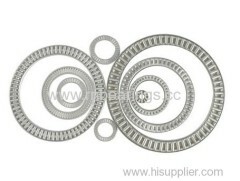 The thrust needle roller bearing or thrust parallel roller bearing is the one only supporting the axial load in one direction. It is used as the bearing allocation having the good rigidity and axial small space. rigidity, Series AS collar shall play its full action. the series ZS collar can be used as axial location or seat hole location.